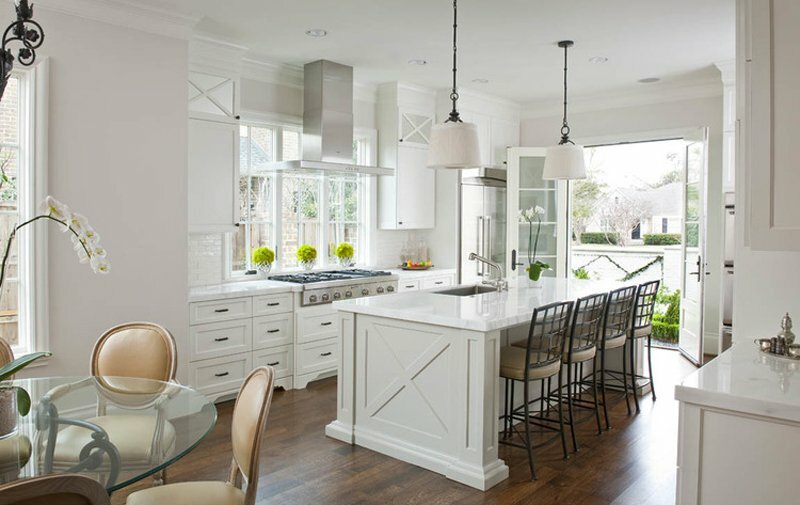 White chandeliers in the kitchen would add elegance to your space. White furniture or decoration may be one color that will definitely make one’s space prettier and sometimes more captivating that it should have been if you have used another color. As we all know, white is a favorite color most people I know of who are involved in the design industry – Architects, Interior Designers and decorators, fashion designers and the like – I mean, who doesn’t love all-white parties right? Today, we would be showing you a couple of photos that are truly captivating and interesting, not sharing this list with your friends could pass for a crime! 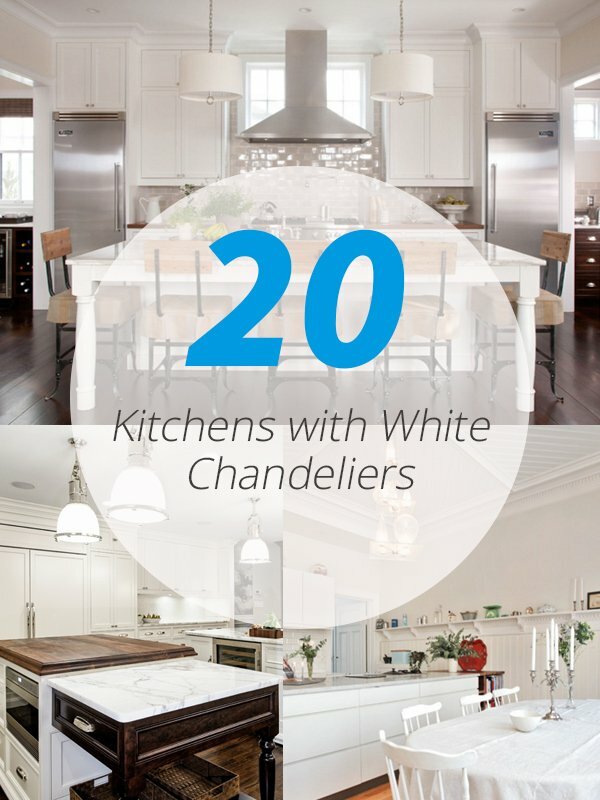 Kidding aside, I think that this list of 20 Stunning Kitchens with White Chandeliers is something for the books because of how beautiful each space in here is – and this could be an inspiration you can use every time you need one. Check out the list and tell us what you think! Let us kick off this list with a contemporary style drum chandelier in the middle of the room! 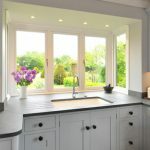 It is just atop a large kitchen table and its countertop is really neat that contrasts and complements well with the counters on each of its side. This kitchen has large windows and I think it’s what makes it real nice and airy. This is one large home with minimal decorations on it which totally makes sense why they chose a simple but glam chandelier in the middle of the kitchen. Second to the flooring (which I loved – this might be the first one I really noticed), the chandelier is a nice feature for this home. What a beautiful design for chandeliers! The curves seen in here by the door sure is a great way of killing too much lines in homes. 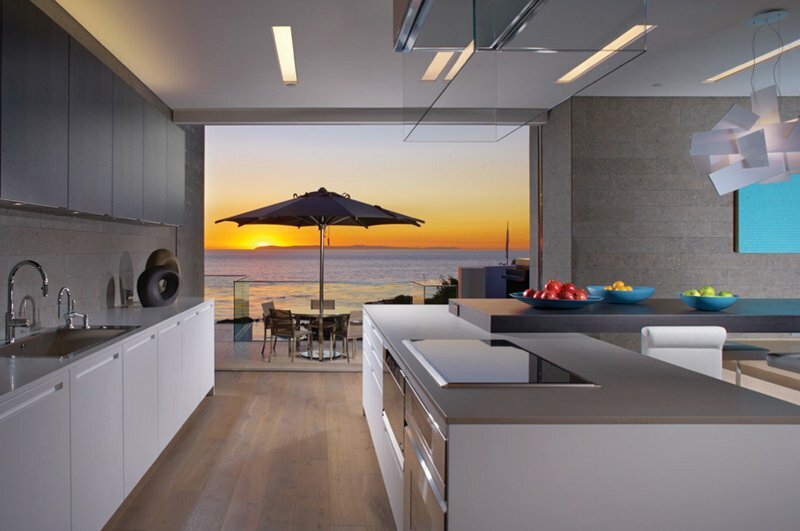 Also try to check the other kitchen below for even more inspiration. 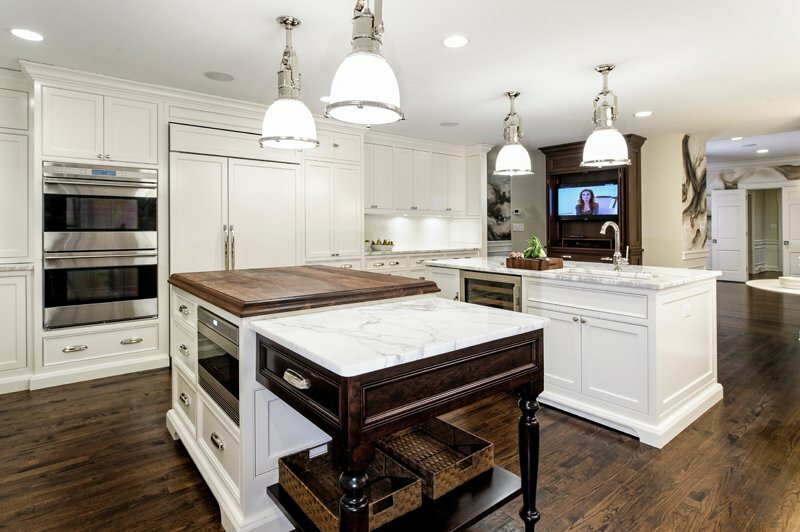 Here is a nice example of an industrial added to a traditional-contemporary kitchen like this one. 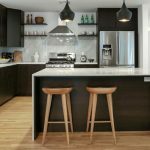 The color combinations of this space is something neutral which is often used in kitchen spaces to explore a cleaner look than when we decide to actually use tons of colors in it. 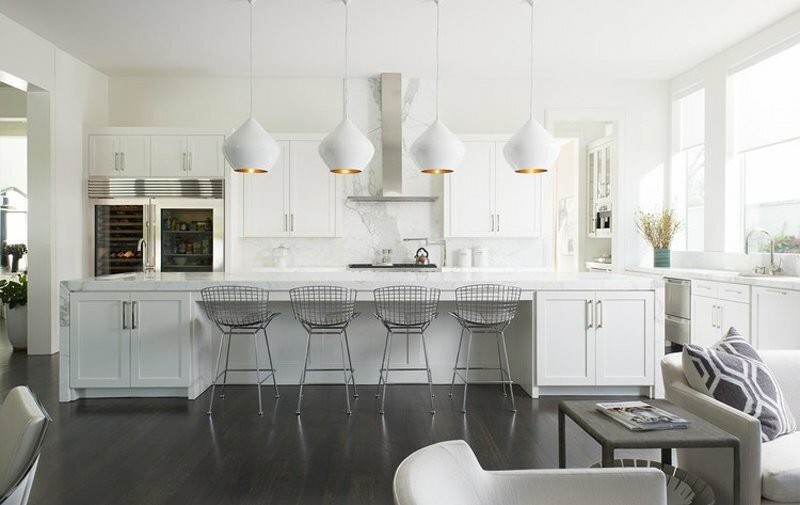 Drum chandeliers are probably one of my favorite styles for chandeliers or pendant lamps because it looks so simple but it looks really well with any type of space – may it be traditional, contemporary, transitional and even modern spaces. 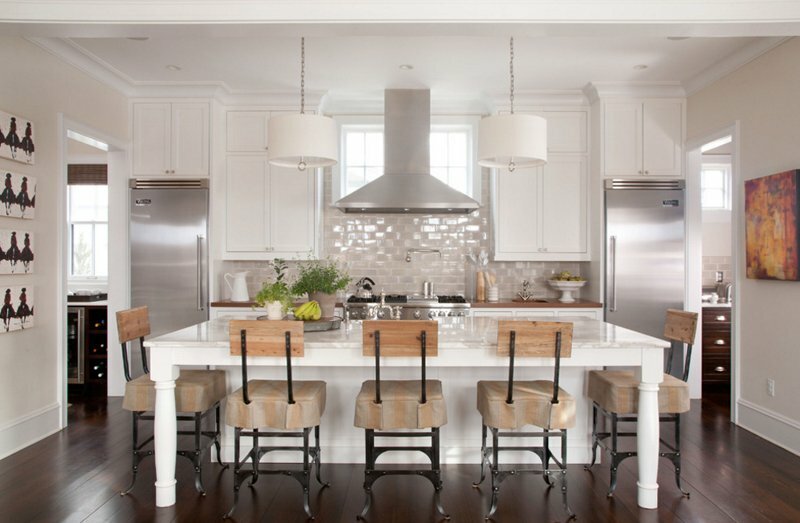 I like how this kitchen actually seem contemporary but at the same time feel traditional and it’s just so beautiful. The chandeliers in this kitchen are a bit of a drum actually, only with a bit of cone feel to it. 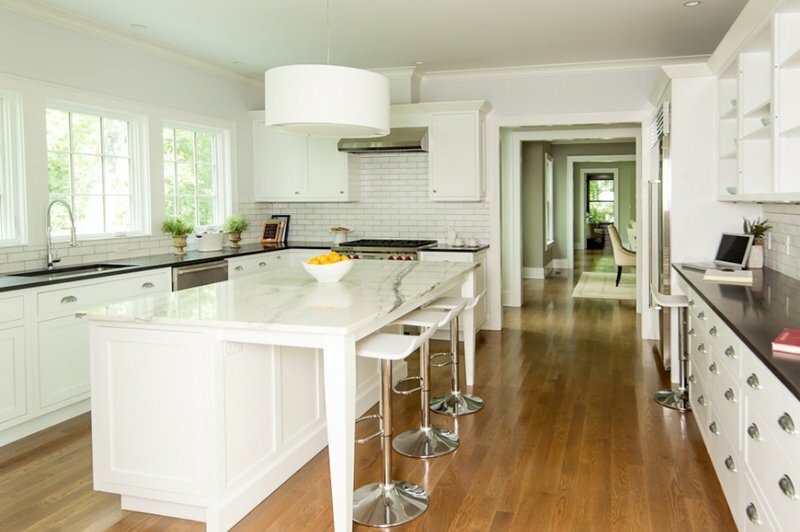 This white kitchen from Ellen Grasso & Sons, LLC is something we see in American homes and still, people loves recreating this in their homes even when it is in fact a common look; but then again, people love things other people love too, and I think it’s normal. Another drum chandelier in the list, ladies and gentlemen! A different take on a drum chandelier but a drum chandelier all the same. This type of chandelier is what everyone like – something usual but then created into something better and prettier to match the personality of the home who would be using it. Well, I think this should have been in the beginning of the list guys! I mean, look at the stunning design of these chandeliers and tell me you do not want to do anything with them because they’re just so pretty and adorable – princess-theme spaces would really love to have these – young or not! 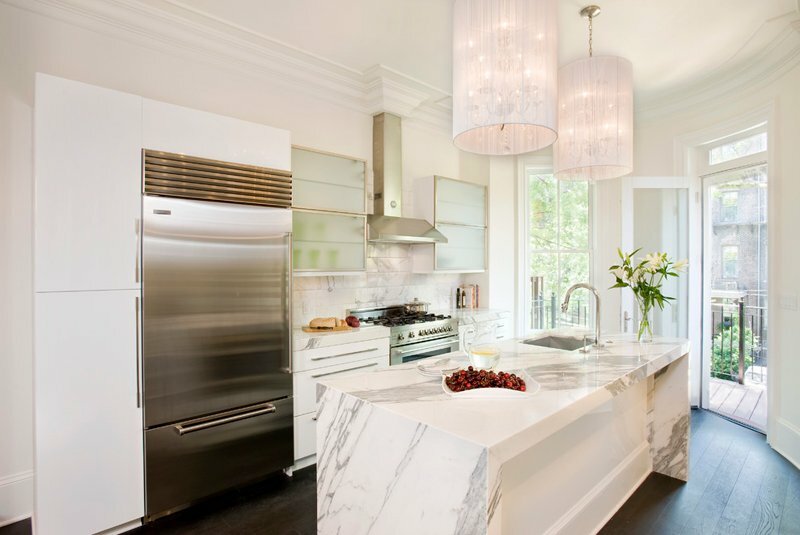 This is a lengthy kitchen that I think sure looks fabulous and special! The colors sure are neutral and it is really perfect! If you notice, there is another beautiful chandelier by the living room and it’s just another stunning piece as this one. I don’t know about you, but these chandeliers are just so pretty this space is like something fresh from a magazine! 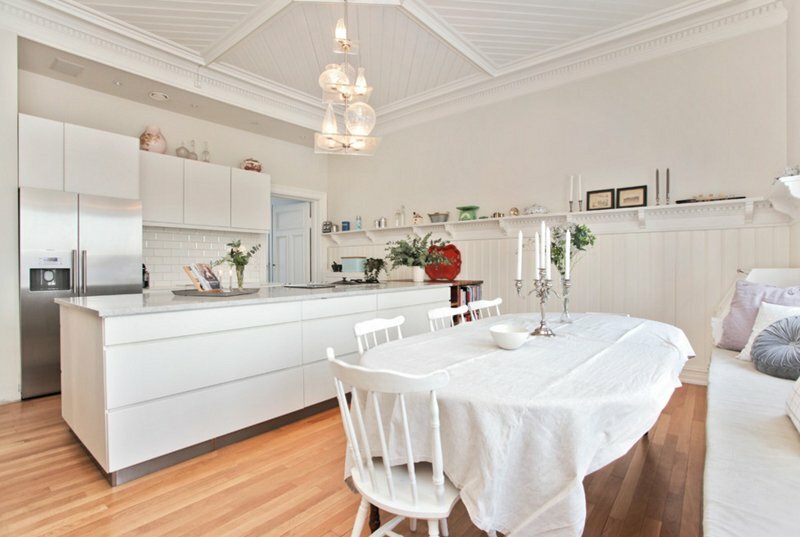 The entire kitchen is in white and it looks incredible and very special! Everything in here – the furniture and decorations – they are just so pretty! I really find this chandelier fascinating, and honestly, I have not been throwing that word as much as I did but this one really deserves it! Look at the design and detail of this beautiful thing in the center of the room! I can’t believe this is in the kitchen when it can surely look stunning in the living room where everyone could really see it. This is a three-piece of charming chandelier combined to create a single one with that much stunning look and class to it. And did you notice that it actually is a bit of industrial too? The metal and the entire design in itself is just as industrial as it is contemporary! I love how it captures the entire look of the kitchen bar area. 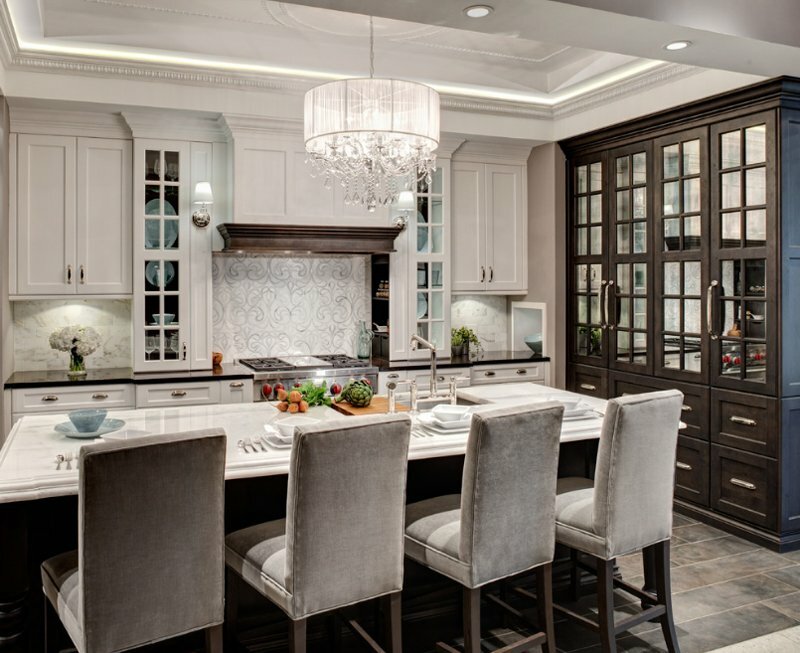 I might have included this kitchen space another time before, but I think that this space is just so nice especially that chandelier in the middle! Don’t you agree? 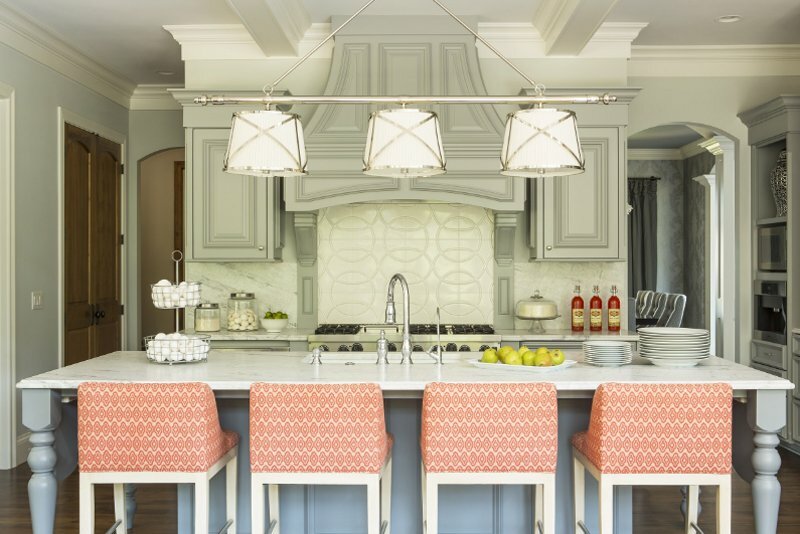 The shell like look and feel to this chandelier is what makes it really special; and the fact that it actually complements with the style of the kitchen is a plus point for this one. There are two kinds of chandeliers seen in here and I think one can attest that this is one practice most home owners do especially when there are things that are too pretty for them, they want it all for their house. I mean, imagine if the chandeliers or lamps in here are similar to one another or of the same design, would it actually make that much of a difference, really? 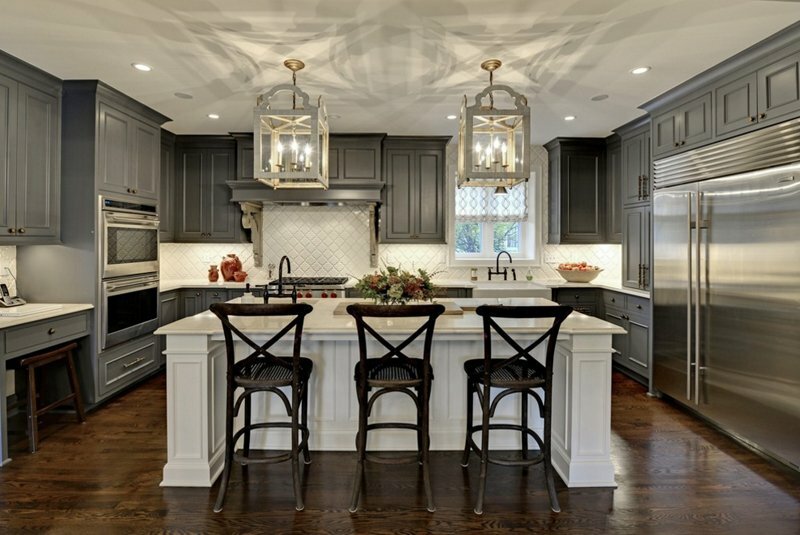 Here are cylindrical chandeliers that are quite stunning for my taste – it’s a bit of contemporary than traditional compared to the major design feat of this kitchen. 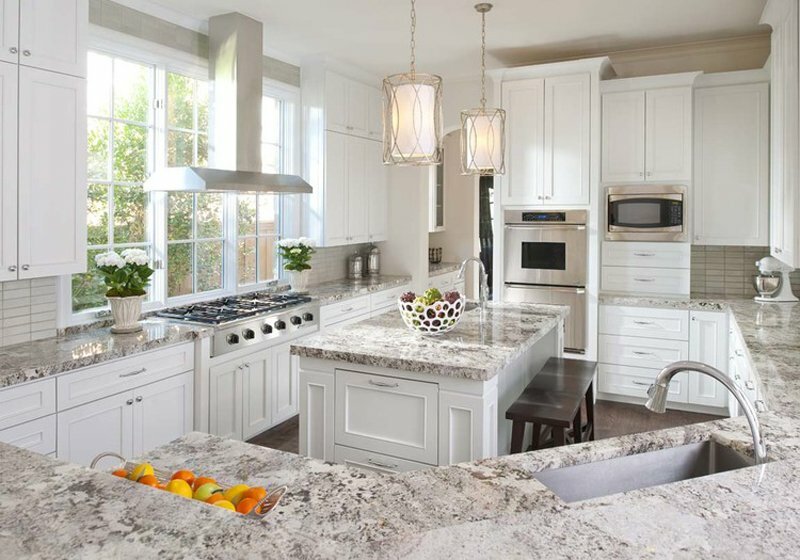 The color of the cabinets and the countertops are but beautiful! I think this is one combination very usual for kitchens, but it sure does work! I think I’m in love! These babies are just looking so charming! They resemble things you might have seen in some movies that involve castles and from its design, you know that they are in fact vintage and just so pretty! 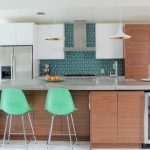 The design might not be as much as matchy with the entire kitchen, but it’s not uncommon to have mismatch furniture or decor in the house, right? This is a simple rendition of what a romantic chandelier or pendant lights are supposed to look like. 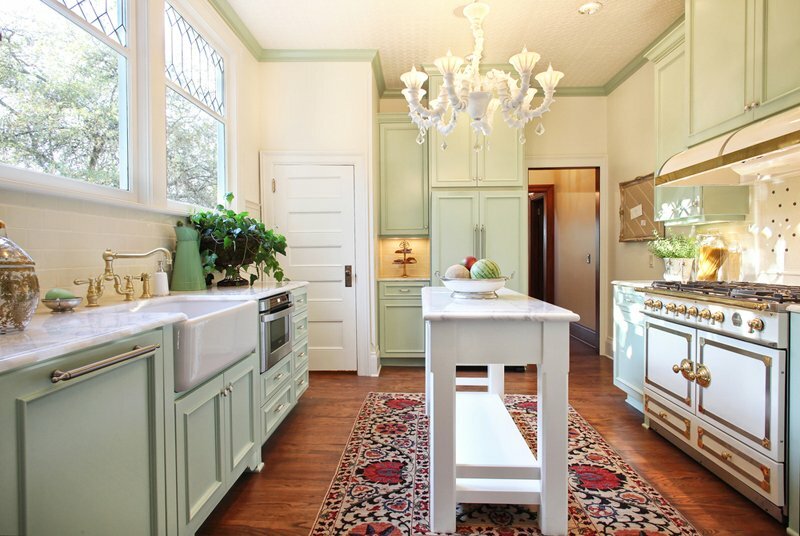 The design is similar to that of something we see in the living rooms which are usually table lamps and I can say that it’s just so charming when they made them into chandeliers you can use in the kitchen! 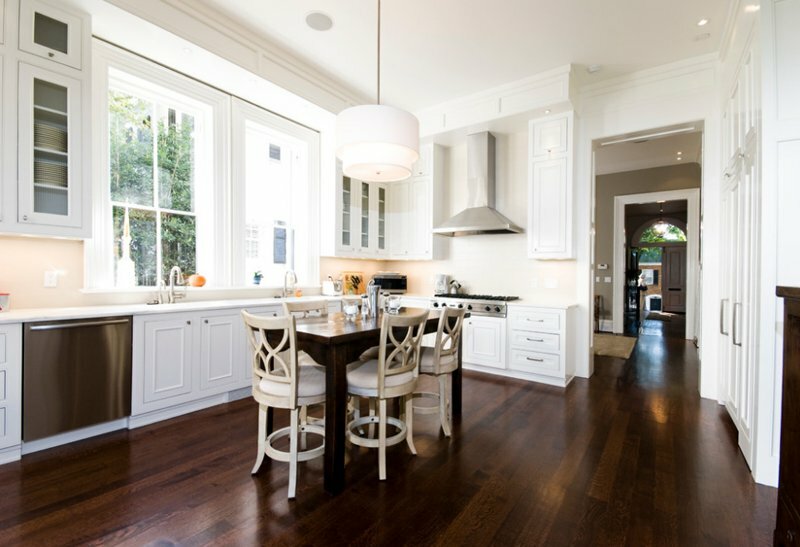 Look at how this kitchen has a combination of a contemporary kitchen and a traditional dining area? The fact that the entire thing is in white – it makes a whole lot of difference and I think it’s just so beautiful and charming. Just like the chandelier atop the kitchen sink – so cool and unique, I think there are only a few of that on the market. These chandeliers are pretty much something created for the large spaces like warehouses because of the amount of light it can emit, but then because we can update it with bulbs of smaller wattage, we can already use them indoors in our very own homes – pretty cool, right? I think I won’t mind having one at home. 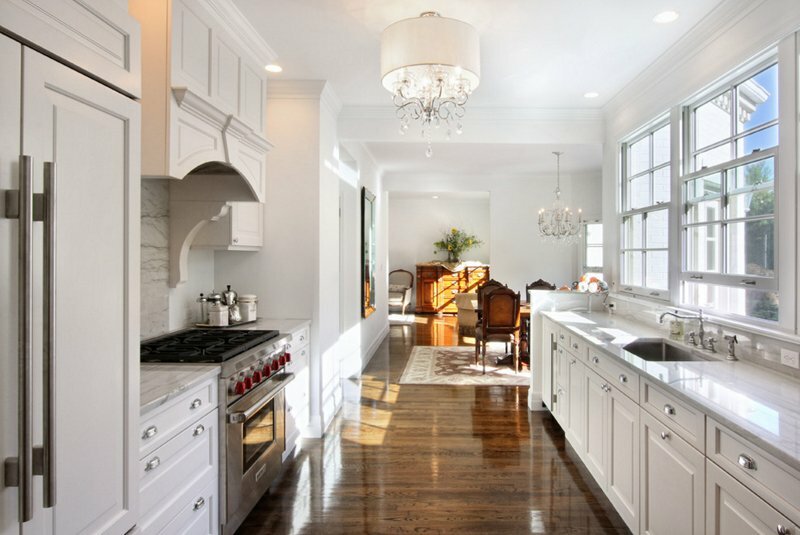 The last photo on this list of 20 Stunning Kitchens with White Chandeliers, may not be the best photo because of the fact that we can’t see the entire thing at this angle, but I think you have a pretty good idea what the entire chandelier looks like and I’m sure you’d agree that it’s beautiful! 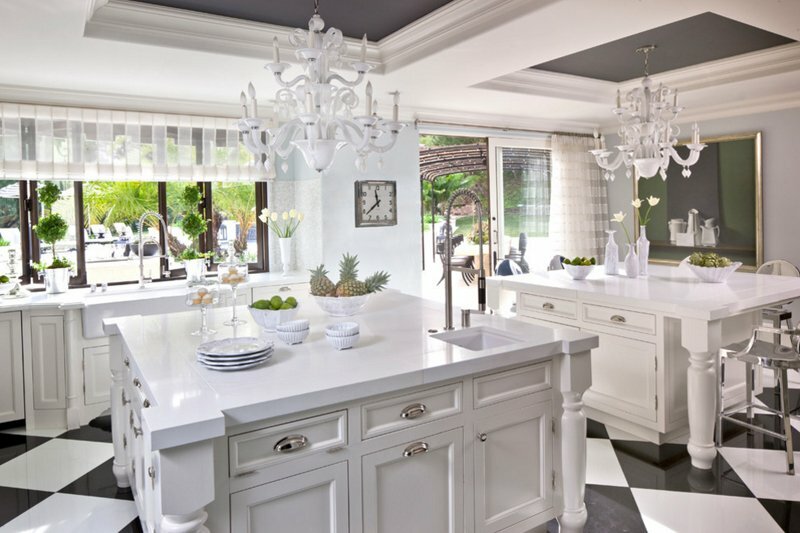 That is one incredible list to contest but, there might be more interesting lists here in Home Design Lover that you can check out if you are looking for a particular topic; but I think that this list of 20 Stunning Kitchens with White Chandeliers might as well be as stunning as the 20 Cool Drum Chandeliers in the Kitchen and you should check that one out for yourself just so you can actually compare the contents of the list. There are tons of chandelier designs and themes and colors in the market, and I think that you should take some time to thinking which ones you want in your house just so you won’t have to be purchasing new ones every now and then!